THIS is how long it is since Hawthorn last played a game for premiership points at the Gabba. It was April 19, 2008. Kevin Rudd was Prime Minister – for the first time. The iPhone had yet to be released in Australia. MySpace, not Facebook was still the social media platform of choice for many and Twitter was mainly for the birds. In footballing terms, it was an eternity ago. The Brisbane Lions were still transitioning out from the team that won three straight flags between 2001 and 2003, while the Hawks were a team with potential, but how much was still unclear. It was a fantastic match, close and tight throughout, with the Hawks eventually kicking away late on a warm evening to win 19.16 (130) to 17.16 (118) to end a seven-game losing run in Brisbane. Lance Franklin kicked 8.6 and was the difference between the two sides. It ranks among the best five games he played for the Hawks. So much has happened since. The Hawks have won four premierships, while the Lions have struggled. Indeed, Hawthorn officials have studied the aftermath of the Lions three-peat very closely and are determined not to follow down the same path. 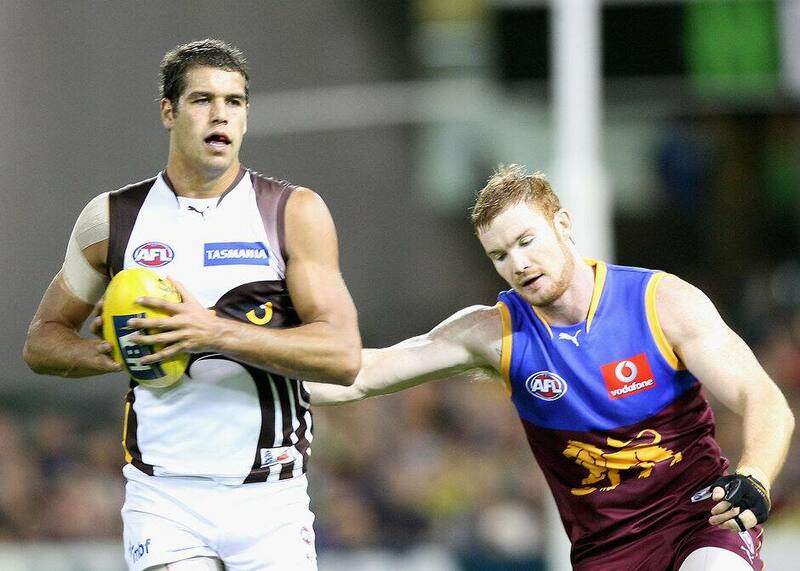 Daniel Merrett will be the sole remaining Lions player on Saturday who played in the 2008 match, while only four Hawks – Sam Mitchell, Jordan Lewis, Grant Birchall and Cyril Rioli took part. Jarryd Roughead and Luke Hodge also played, but are unavailable this time around. Six other Hawks – James Frawley, Josh Gibson, Jack Gunston, Ben McEvoy, Matt Spangher and Shaun Burgoyne have previously played at the Gabba for other clubs. Mitchell told AFL.com.au this week that he didn't hold such brilliant memories of the Gabba. Among his misadventures there include being cleaned up by Jonathan Brown and a dreadful deliberate out-of-bounds decision that swung a game the Lions' way in 2003. "I guess now it would be paid deliberate and nobody would bat an eyelid, but back then it was a strange one," he said. Another memory was of the first game of 2007 when the Lions won a low-scoring clash by 25 points. Mitchell remembers the ball being locked in the Lions forward line for most of the night and Hawthorn defender Danny Jacobs taking 20 marks, most of them uncontested. Mitchell said the main adjustment for the Hawks would be the centre square area. He said it is rare for the Hawks to play on a ground that still has cricket pitches in the middle. "That always creates a bit of a challenge because the bounce in that part of the ground is different to elsewhere. "But the Gabba is a similar size to the MCG so it will help us to play on a ground with the same dimensions," he added. "It is always a challenge when you have not played there a lot, but all teams have to deal with it." The Hawks have played 174 games since their last Gabba clash and AFL statisticians believe no club has gone as long between engagements at a regular League venue, with the exception of the large-drawing teams which these days never get drawn to play Geelong at Simonds Stadium. It is not for want of trying. Hawthorn has a solid supporter base in southeast Queensland, drawn to the club during the successful 1980s era in which Coorparoo's Jason Dunstall was a leading figure. Gold Coast-raised Nick Riewoldt was a huge Hawthorn supporter for that reason before being drafted to St Kilda in 2000. The Hawks have requested a game at the Gabba for several years, but their Queensland-based supporters have had to settle for a pair of games down the M1 against Gold Coast as a consolation. For their part, the Lions are happy to have the AFL powerhouse coming to town even if it shapes as a tough afternoon on the ground. Given the expected fine weather, they expect a crowd of around 23,000, which they say is good for a Saturday afternoon when there are competing attractions such as local sport. The Lions have averaged 19,300 at the Gabba in 2016 and their largest crowd so far was 24,500 for the Collingwood game a fortnight ago.